I know pumpkin is usually a flavor reserved for fall, but it's still cold where I live. 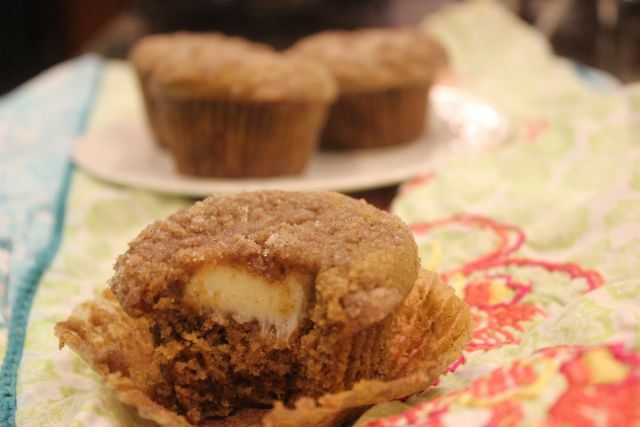 So I decided it's perfectly acceptable to make these pumpkin muffins. Actually, it's perfectly acceptable for you to make them any time of year you choose! 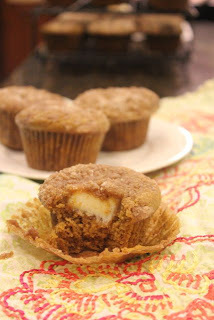 These muffins are similar to (not exactly the same as) the pumpkin cream cheese muffins you can get at Starbucks. These would go especially well with a nice spiced chai tea latte. To make the topping, combine the sugar, flour, and cinnamon in a small bowl. Cut in the butter using two forks or a pastry blender. Mix until the mixture is course and crumbly. Preheat your oven to 350 degrees. Prepare a 12-cup muffin pan with paper liners. In a medium bowl, combine the flour, spices, salt, and baking soda and whisk to blend. In a large bowl, using an electric mixer, combine the eggs, sugar, pumpkin puree, and oil. Slowly add the dry ingredients and mix until just blended. Divide the batter evenly among the 12 muffin cups, keeping about 1 cup aside. Top each with a slice of the cream cheese mixture. Divide the remaining 1 cup of batter among the muffins, covering the cream cheese mixture. Sprinkle the muffins with the topping and bake for 20 to 25 minutes. Cool muffins on a wire rack. Enjoy! !